he Samnites were among the first inhabitants of Molise. Subdivided into five tribes: Caraceni, Irpini, Caudini, Pentri e Frentani; they dedicated themselves to sheep farming, and being courageous warriors; they also earned a living acting as mercenaries. The territory was organized into little villages called vici. The principal ci ties of Molise were: Isernia, Trivento, Sepino, Larino (capital of the Frentani), Boiano, (capital of the Pentri). The center of worship (Santuario) was Pietrabbondante. The magistrate of the city was called Maddix. According to tradition, the Samnites are native to Sabbinia; others claim that following a “Ver Sacrum” (an emigration) they arrived at a hill called “Saminnium”. The “Ver Sacrum” is a dedication made to a divinity (Ares – Mars), from all the men and animals born in a determined year. The young, once mature (20 yrs old) were forced to abandon the communities to which they belonged (instead of the antique usage of human sacrifice) and to set out in search of new lands. They were led on this voyage of theirs by a sacred animal (a wolf, a bull or a woodpecker) whose name often referred to the group (Irpini, Pentri, Piceni). Sometimes there was a Dux (a leader of the city militia) who guided them. The origin of the Ver Sacrum has its roots in the outbreak of famine and the constant need of new fertile lands as a result of population growth. They spoke the language of Osca, and therefore belonged to the Osco –Umbri. There is a precious archeological example, the famous Table of Agnone (photo), on which the Oscan alphabet is inscribed. It is being exhibited at the moment in London at the British Museum. The territory of Morrone was disputed between the Pentri and the Frentani. As a result of the subdivision made by Emperor Augusto in the 2nd century A.D., along with Apulia (Puglia), Morrone was incorporated into the Frentano thus becoming part of the second region. In commercial exchanges barter was the most popular practice. In very early times money had not yet been minted. The five Samnitic tribes, with a collective population of around 600,000, would join forces in the case of war. The dead were buried face up in the grave. 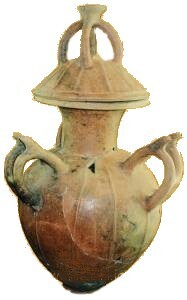 An “olla” vase (similar to an urn) filled with a supply of food was placed on the feet of the dead. Offering one’s daughter in marriage to the first man that came forward was not permitted. Every year the most beautiful girls were selected and they got married to the most courageous young men. If a young man behaved dishonorably he was deprived of his wife and alienated from his tribe. Among the many wars carried out by the Samnites, the ones against the Romans marked their disappearance and their end as a tribal entity. These wars were waged for the supremacy of the territory. There were three Holy Wars. At the end of the 1st Holy War in 321 B.C., the Roman Army, defeated at the “Caudinian Forks”, was forced to undergo the humiliation of passing under the giogo. The giogo was a fork-like object constructed from two vertically positioned rocks with a third placed horizontally on their ends, thus forming a structure similar to a doorframe. In this antique practice, defeated enemies were forced to pass under the giogo so as to humiliate them. A year later in Lucera, in 320 B.C., there was the 2nd Holy War in which the defeated Samnites, as a retaliatory act were forced by the Romans to undergo the same humiliation of passing under the giogo...The 3rd Holy War concluded in 292 B.C. and represented the definitive defeat of the Samnites. As a result of this defeat all of their territory remained under firm Roman dominion and was divided into districts represented by town councils, Morrone belonging to the municipal of Larino.